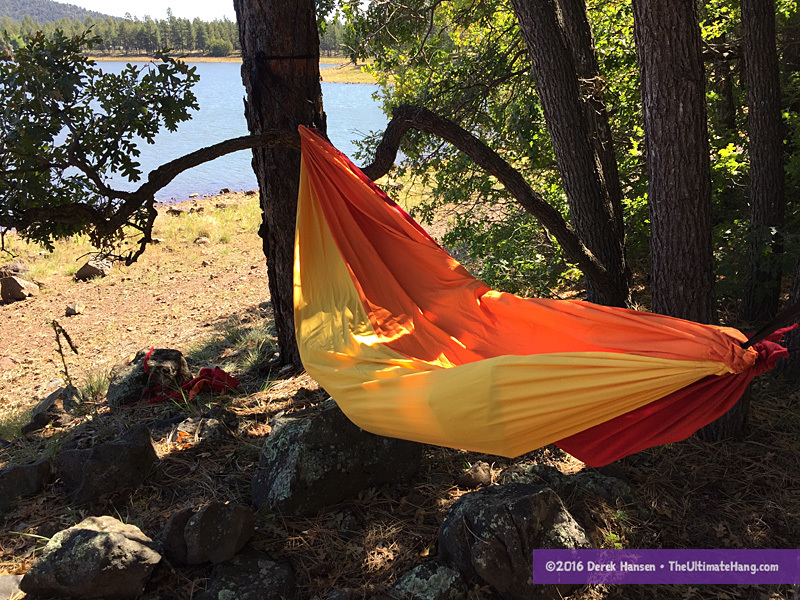 The Ar•Ya Hammock (pronounced like it spells, but feels more like “aaahhh-yeah!”) is an open, three-panel “double” hammock that has some pretty phenomenal fabric and accessories that hammock aficionados will love. The weight rating is one of the highest for any hammock, making this a great option for big and tall folks. The Ar•Ya Hammock is made in Delhi, India, but the company is a small shop run by two passionate gentlemen: Calvin Rieger and Andy Harper. It’s really a partnership of two of friends between two countries, launching in the US and Europe (Reiger is from Austria and Harper is from Tennessee). The hammock itself has some of the most precise sewing as I’ve seen, even from cottage vendors. The three panels are wide, all about the same width, 35 in (89 cm). 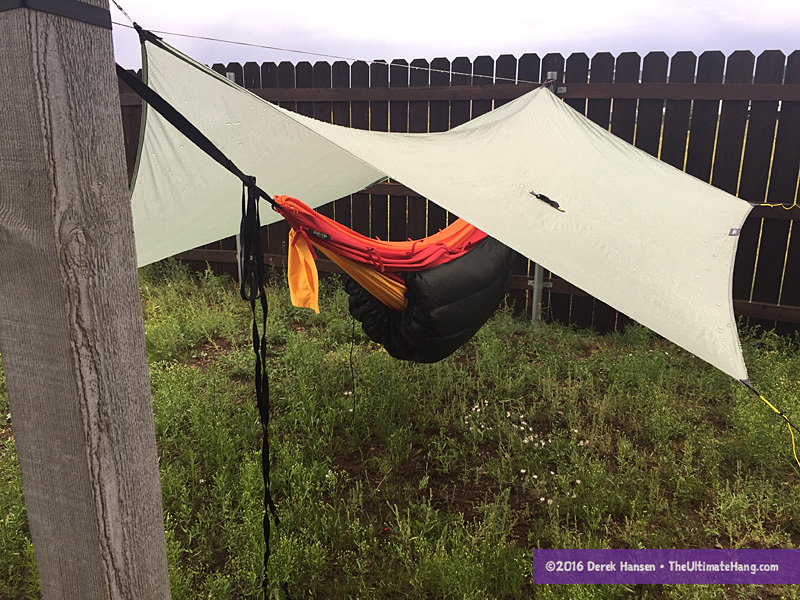 The dimensions, 104 × 85 in (264 × 216 cm), are pretty close to square, making this one of the widest hammocks I’ve tested. The short ends have a sewn end channel and are gathered together with a long, thin webbing strap. The webbing strap serves to not only gather up the ends, but act as the suspension and tree webbing. The advantage of this design is that the fabric can be opened up without really dismantling the hammock. This gives the Ar•Ya a lot of flexibility to work as a ground sheet on the beach, a bed sheet, or lightweight wrap. When opened as a fabric sheet, the possibilities can include folding and wrapping the Ar•Ya as a sarong, privacy screen, sun shade, or wind shield. The Ar•Ya suspension is designed to wrap around an anchor point and then brought back around to be tied together as you would tie a pair of shoes. First, tie an overhand knot, followed by a bow knot. This is the same way that Hammock Bliss recommends tying up their hammocks. While this is not my preferred method to string up a hammock, it has some benefits, especially how the Ar•Ya is designed to be opened up and lay flat without removing the suspension. However, I have had the bowtie method slip and fail on me numerous times, including around trees, on carabiners, and eye bolts. You can stop the slippage by tying a double bow, but once weight is applied, that bow becomes much more difficult to untie. I love how easy the singe bow know comes apart when unpacking. When paired with a wider webbing strap, the bow knot works even better. Other knots can be used, like the slippery Becket Hitch. I usually recommend or at least knowledge that you can swap out and use whatever suspension system you prefer, but for the Ar•Ya, the suspension really becomes part of how the hammock works. For example, because the ends use a long, continuous loop, the hammock doesn’t bunch up. This means the long sides relax and move depending on how weight is distributing across the bias of the fabric. This allows for a much more comfortable lay when lying diagonally. For these reasons, I don’t recommend removing the suspension unless you want to forgo the modularity of this hammock. I showed a co-worker the Ar•Ya and he never budged. The fabric is a synthetic blend of polyester and other unnamed fibers. The finish feels much more like a brushed cotton than a plastic or crinkly nylon. One one of the short ends, a small pillow-pocket pouch is sewn. It’s small enough to almost miss, but big enough to hold a smartphone, keys, or other item. Also included is a detached pillow pocket, designed to hold the hammock when not being used. Last, but not least, is the satchel. This zippered carry-all is like a mini hammock with gathered ends that can open up like a double-sided stuff sack. Fabric straps cinch up the ends and include clips and rings that can be clasped together to make an adjustable shoulder strap. First off, I’m mesmerized by the smell of the fabric, of all the odd things. For some reason, it reminds me of a few fond memories of my past. I’m sure it’s just a factory smell, but I’ve been teased relentlessly by my family for just holding it up and wafting the aroma. I’ve never done that with a hammock before. The fabric is cozy. I’d love to know the material, even if the percentages and process are kept secret. The fabric is warm too. I visited southern Utah while testing and it was in the low 100°F and the hammock was a little too warm to use. I could still feel a breeze, but in that heat it was probably not ideal. I really love the zipper pouch and carry-all. It’s a great accessory. It makes a great gear hammock, since the shoulder strap can be disconnected and used as suspension. Thanks to the tie-loops on the hammock, the satchel can be attached directly to the hammock as a convenient saddle bag. Addition cordage is necessary to hang the satchel as a ridge line. The Ar•Ya has one of the best fabrics I’ve ever seen in a hammock. Did I mention the smell? Okay, that’s weird, but I am reviewing a hammock after all. The only thing I really don’t like about this hammock are the seams, but that’s been my mantra about every hammock made from multiple panels of fabric. On the plus side, the panels on the Ar•Ya are wide enough that I can position my body to avoid the seams for the most part. It’s a compromise I’m willing to live with (until they come out with a single panel version; hint-hint). This is the kind of hammock you want for indoor or backyard hangs. The fabric is so comfortable against my skin. Flapping over the sides on top of me is sometimes all I needed during warm nights. It’s a little heavy for backpacking, but taking this hammock car camping or lounging while recreating is a great idea. The satchel is just fun to carry around. When the hammock is inside, there is enough room to sneak a few more items. Suspension and Anchor System ♥ ♥ ♥ ♥ ♥ I love how the suspension can be easily loosened to expand the hammock, but the webbing is pretty thin for tree protection. The bowtie method works fine, but is prone to slippage in some use cases (a double knot fixes this, but makes it harder to untie). Construction and Craftsmanship ♥ ♥ ♥ ♥ ♥ High-quality build throughout. Aesthetics ♥ ♥ ♥ ♥ ♥ The carry bag is a great addition. Comes in a variety of colors. Price and Value ♥ ♥ ♥ ♥ ♥ I always pause when I see a non-woven, open, gathered-end hammock tip the US$100 scale. The fabric, accessories, modularity, and build quality are all fantastic, but I wish it were just a little more affordable. That said, this is a hammock you will treasure. I doubt I’d ever use it as a ground cloth, preferring to wrap myself in it. It has double the constriction than a regular bow on the slippery part of the knot, but it’s still easy to untie with a tug. If this is what you mean by a double bow in your post, then well…. never mind.